The coccyx, or tailbone, is formed by a fusion of four vertebrae. 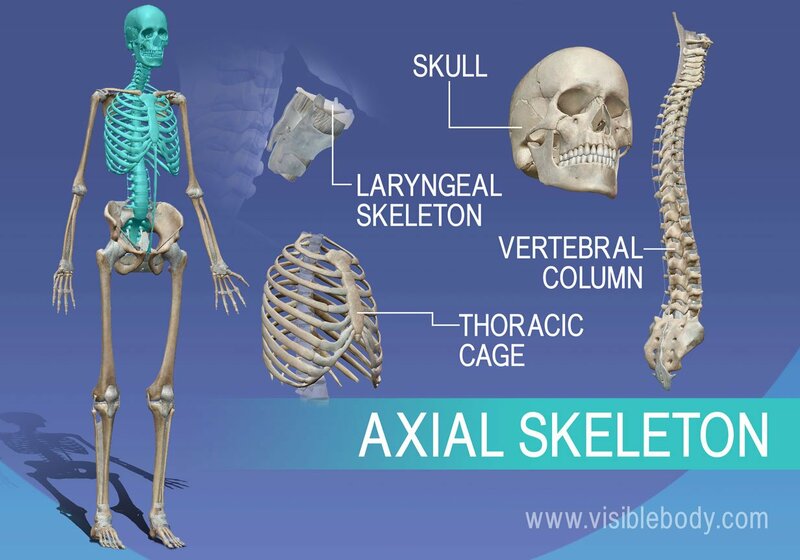 The axial skeleton includes the bones that form the skull, laryngeal skeleton, vertebral column, and thoracic cage. The bones of the appendicular skeleton (the limbs and girdles) “append” to the axial skeleton. 1. Skull Bones Protect the Brain and Form an Entrance to the Body. 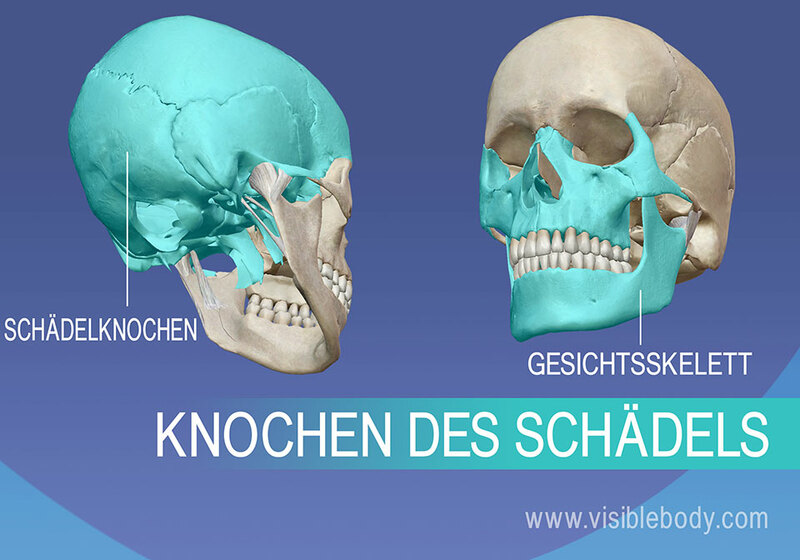 The skull consists of the cranial bones and the facial skeleton. The cranial bones compose the top and back of the skull and enclose the brain. 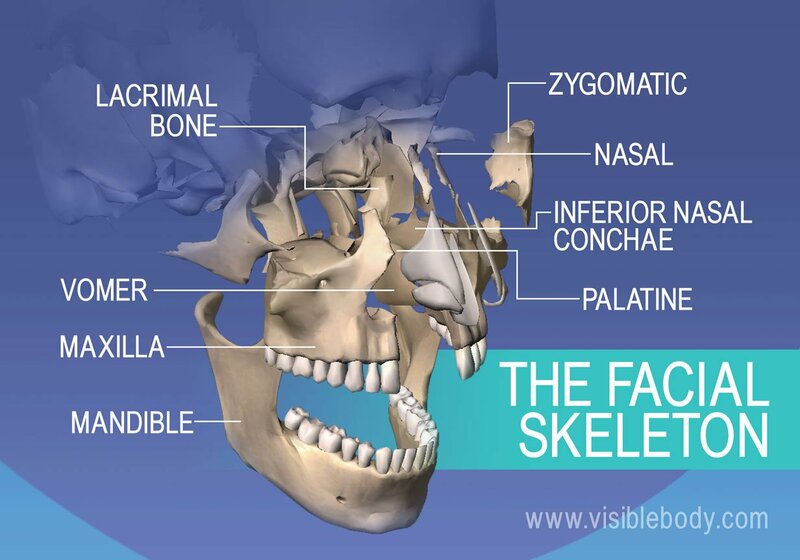 The facial skeleton, as its name suggests, makes up the face of the skull. The 14 bones of the facial skeleton form the entrances to the respiratory and digestive tracts. The facial skeleton is formed by the mandible, maxillae (r,l), zygomatics (r,l), and the bones that give shape to the nasal cavity: lacrimals (r,l), nasals (r,l), vomer, palatines (r,l), and the nasal conchae (r,l). 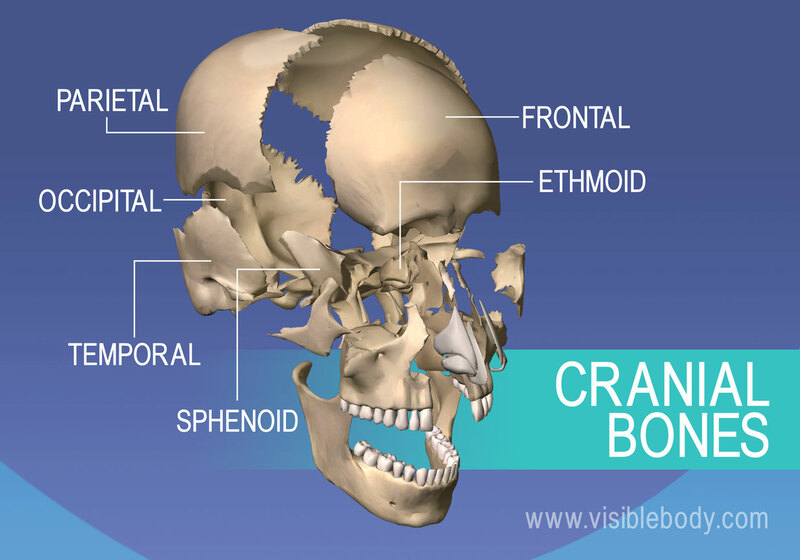 The eight cranial bones support and protect the brain: occipital bone, parietal bone (r,l), temporal bone (r,l), frontal bone, sphenoid, and ethmoid. 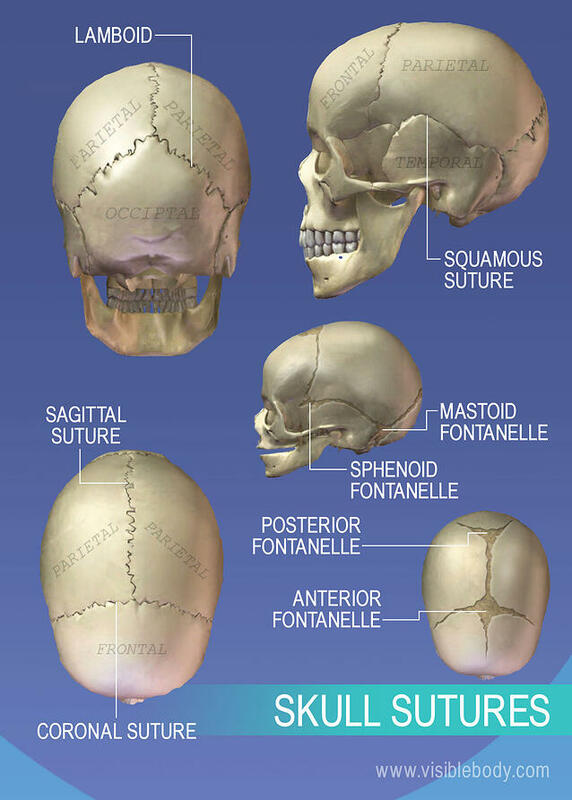 In fetuses and newborn infants, cranial bones are connected by flexible fibrous sutures, including large regions of fibrous membranes called fontanelles. These regions allow the skull to enlarge to accommodate the growing brain. The sphenoidal, mastoid, and posterior fontanelles close after two months, while the anterior fontanelle may exist for up to two years. As fontanelles close, sutures develop. Skull sutures are immobile joints where cranial bones are connected with dense fibrous tissue. 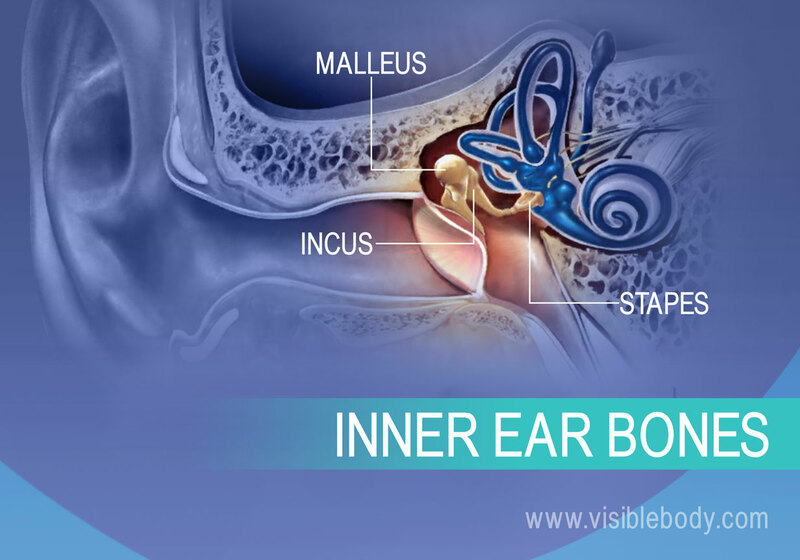 Inside the petrous part of the temporal bone are the three smallest bones of the body: the malleus, incus, and stapes. These three bones articulate with each other and transfer vibrations from the tympanic membrane to the inner ear. 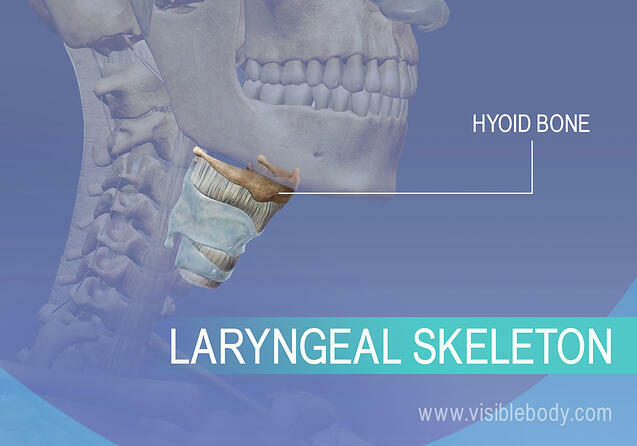 The laryngeal skeleton, also known as the larynx or voice box, is composed of nine cartilages. It is located between the trachea and the root of the tongue. The hyoid bone provides an anchor point. The movements of the laryngeal skeleton both open and close the glottis and regulate the degree of tension of the vocal folds, which–when air is forced through them–produce vocal sounds. 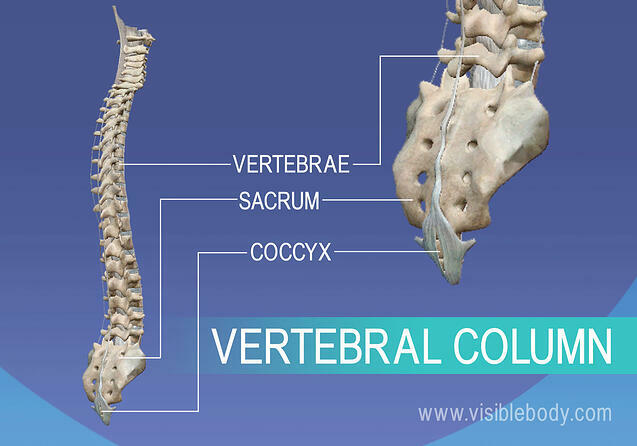 The vertebral column is a flexible column formed by a series of 24 vertebrae, plus the sacrum and coccyx. Commonly referred to as the spine, the vertebral column extends from the base of the skull to the pelvis. The spinal cord passes from the foramen magnum of the skull through the vertebral canal within the vertebral column. The vertebral column is grouped into five regions: the cervical spine (C01-C07), the thoracic spine (T01- T-12), the lumbar spine (L01-L05), the sacral spine, and the coccygeal spine. 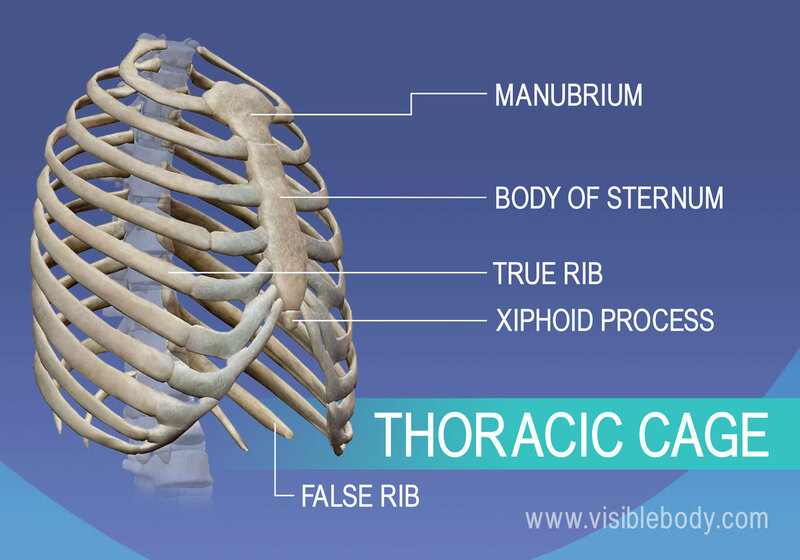 The thoracic cage, formed by the ribs and sternum, protects internal organs and gives attachment to muscles involved in respiration and upper limb movement. The sternum consists of the manubrium, body of the sternum, and xiphoid process. Ribs 1-7 are called true ribs because they articulate directly to the sternum, and ribs 8-12 are known as false ribs. Ancient jaw may hold clues to origin of human genus from Science News. Chapter 28, Skeletal Development from the book Principles of Developmental Genetics. Moody, Sally A., ed. Principles of Developmental Genetics. Waltham: Elsevier Inc., 2015. Print.